The first thing that the mind links with Tunisia is the sea. This post is not about it. Well, not exactly. The sea has been been such a great power in the country’s history, culture and soul that Tunisia is unthinkable without the sea. This post is about the the capital, Tunis. I have decided to split it into two parts: The (Obvious) Great Things and The (Hidden) Gems. The things Tunis is best known for are Carthage, Sidi Bou Said and The Souks. Why talking about them if they are so well-known? They are still stunning. Carthage is a must read in the Tunisian history book because it reveals so much about the country. (Archaeological site of Carthage is listed as UNESCO Heritage, but this brand has forever lost my trust after our escapade to Colonia in Uruguay, another UNESCO protected site.) The city of Carthage, the ancient capital of the Carthaginian civilization, dominating in the 1st century B.C. the entire Mediterranean, is told to be founded in 814 B.C. in a beautifully dramatic Oriental spirit by the Queen Alissar (an Arab city founded by a woman, love that). Alissar, also known as Elissa or Dido, fled her slightly tyrannic brother Pygmalion from the Phoenician city of Tyre after he had murdered his sister’s husband, wealthy and powerful Acerbas (also known as Sychaeus, also the High Priest Melqart and an uncle to both Pygmalion and Alissar. So much for the family ties). Alissar founded Carthage on a piece of land she purchased from a local tribe. Now, how does a young woman flees the city, presumably alone or with a small group of people, carrying enough gold or other convertibles to buy herself a kingdom? Answer: smart people don’t always need a lot of gold. Or convertibles. Smart women, that is. When defining the size of the land to buy, Alissar promises not to take more than an oxhide, a skin of ox, can cover. And then she shakes hands and cuts this skin (hypothetical, I hope) into very, very thin slices, expanding the purchased territory tremendously. See, what would any man do in her place? Fight, die and probably become a legend, of a sort. Alissar, on the other hand, in some seven years builds a kingdom and becomes its very popular, and very prosperous reign. But, as said, it is an Oriental tale and the drama does not end so easily (and there was not enough word about love yet). It a truly progressive spirit, Alissar gives shelter to a Trojan hero Aeneas, who, just like the Queen herself some time ago, fled Troy, when the city fell. Alissar’s courtesy is extensively praised in the Roman epic of Virgil, The Aeneid. In a good dramatic tradition, Alissar and Aeneas (who, by the way, is a son of Venus, to add the colors) fall in love and after one year get married, deciding to rule their people together on the land initially purchased from the ox’ skin. Sidi Bou Said is just next door to the ancient Carthage. It is now a suburb of modern Tunis, 20km away from the city center, Medina. 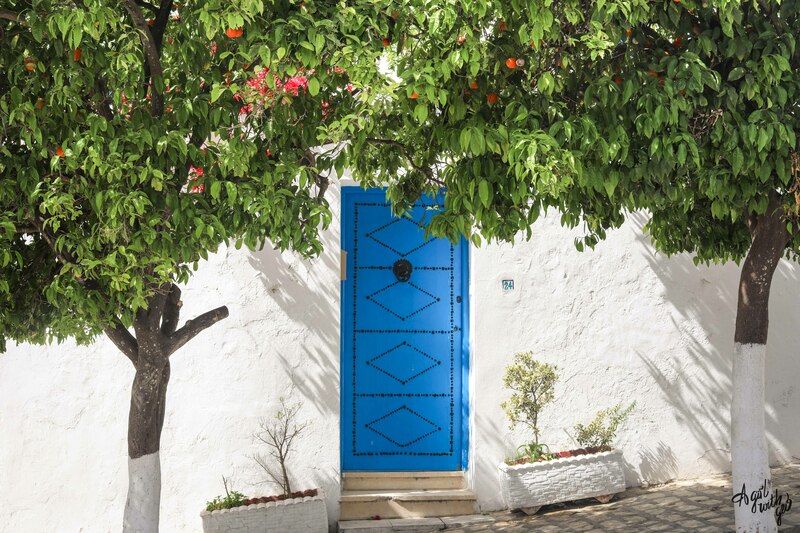 Unlike every other city, praised for its center and largely unknown for its suburbs, Tunis lays out its treasures on the outskirts. Close to the sea. Property prices raise accordingly, and living in Tunis’ suburbs are times more expensive than staying in the city center. Sidi Bou Said does not have such a dramatic history as Carthage, enough of drama for one post. What is does have in abundance is art – and artists. The entire city is white and blue. I would go ahead and say “like Greek islands” but, now, familiar with the history of all the Mediterranean wars, won’t take such a risk. It is all white and blue, though. Gorgeous. Café des Délices, with its stunning coastal views, is no less famous that the city’s postcard architecture. The Souks of Tunis are a chain of linked artisan shops, offering everything from jewellery and shoes to sweets and perfumes. Again, if it would not be for the political risks, I would compare the Souks of Tunis to the Grand Bazaar of Istanbul (The Souks of Tunis are smaller, cosier, feel much less industrialised and are actually enjoyed by the locals) and that of Marrakesh (but without the photogenic snakes and their commercially inclined owners on the central square). I have enjoyed the Souks. And some of the stuff you can buy there is just art. The only thing I was not 100% sure about is the perfumes, Chance de Chanel (actually, smelling like the Chance de Chanel) side by side with the Nuit de Tunis. And, of course, I loved the stray cats. The Tunisians don’t strike me as the biggest animal lovers of all times, the cats look quiet savage, but there are many of them, the they roam free and rule their own world. Liked my pick on The (Obvious) Great Things of Tunis? Wait for the next post on its Hidden Gems. Thank you Rosie! 🙂 Tunis was a surprise to me as well, yes )) some of the city central corners are also great and worthy – more on that soon!